The Montana METALLIC EFFECT sprays offer several trend metallic colors that are fast drying, weather- and abrasion proof once they are fully cured. The METALLICs are ideal for indoor or outdoor application offering a clean and broad spray output for optimum surface coverage. For best results on pre-primed white or light color substrates, apply a minimum of 2-3 thin coats allowing 10 minutes to dry between coats. Dark substrates may require more coats. Additional coats should not be applied while paint is still wet. Apply the Effect Spray at a distance of 15-20cm’s. Surfaces should be clean and dry before application. The smoother the substrate, the more intense the color finish. Remove the safety ring by removing the nozzle and turning the can upside down. Shake can well for 3 minutes and re-shake after every pause in application. During application, protect the surrounding area from spray mist. At 20°C, Montana METALLIC EFFECT sprays are dust dry after approx. 10 min. Touch dry after approx. 20 min. and Fully cured after 24hours. The lacquer is scratch and weather proof when sealed with Montana Varnish. The spray surface must be totally cured before sealing. METALLIC EFFECT sprays can be combined with Montana GOLD and Montana BLACK cans as well as Montana ACRYLIC markers. The Montana Metallic Effect Sprays bring state of the art paint technology to traditional metallic effect colors. 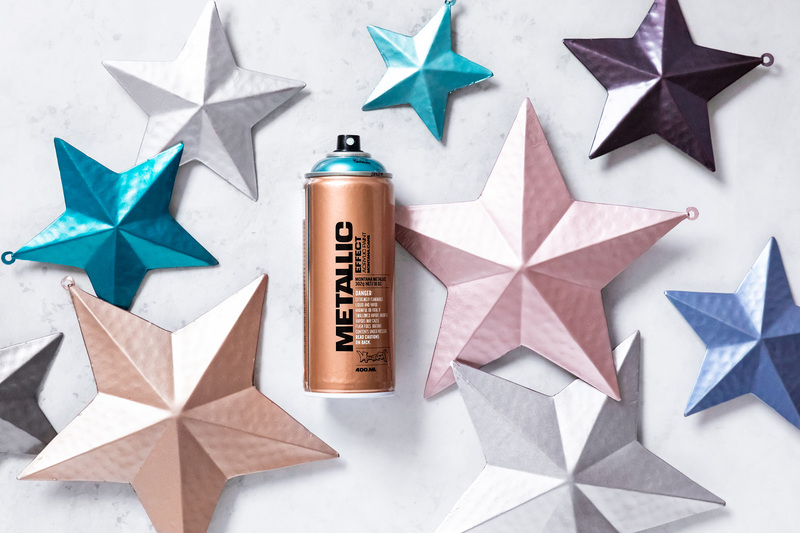 They can add a metallic flare to any creative or artistic project on many substrates.The Montana METALLIC EFFECT range, Highest Spray Paint quality made in Germany.